The Philosophy Behind Inbox Zero? Go Forth And Save Time! Inbox Zero follows the GTD philosophy as a great way to keep your inbox clean and under control. We discuss what it is and killer tools used to achieve it. Technology has finally penetrated every part of our lives. It’s no longer enough to just use technology for an edge because everybody does, you now must use it effectively. It’s about time you let Inbox Zero save your life. Right now you’re probably thinking, “Oh great, another buzz word I have to remember”, however the best part about Inbox Zero is that its primary goal is for you to remember less. Here I’m going to tell you the philosophy behind Inbox Zero, what Inbox Zero is, why you should care and the free tools that you can use to get to zero. Inbox Zero in its most basic form is about having zero emails in all of your email inboxes. Achieving inbox zero as a philosophy is about a lot more than that. It all started with David Allen and his amazing book Getting Things Done (GTD). He noticed that he was continually juggling a million tasks that needed to be completed. The worst part about it was that managing all of those tasks took the same amount of brain juice and time as actually completing the work, plus trying to keep track of it all gave him anxiety. He knew there had to be a better way. David came up with a very simple and intuitive system which allowed him to get task remembering and tracking out of his head. 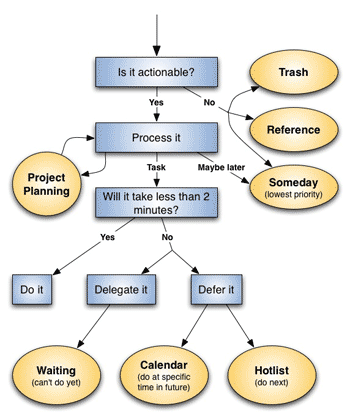 Simply put, he decided to classify his work based on the simple flow chart above. You’ll have to read the book to get the meat of it but basically his approach is to process your tasks immediately so that they will be completed in an efficient manner. More importantly, your tasks will not clutter your brain so you can use your brain for other more important things like getting things done or having fun. Enter Inbox Zero, a modern adaptation of GTD for your Email Inbox. The problem is that the uses of email have evolved from what it was originally intended to be. Many of us receive dozens or hundreds of emails a day and the majority of them are not just for reading. Most emails require some sort of action. To complete an email you may need to just reply in detail but often times it will require some more involved work on your part. When you need to take action on an email and you don’t have the time as soon as it arrives, that’s where you run into a problem. Currently, email has no easy way for you to remember and step through your pending tasks. Sure you can use a combination of flags and labels/folders but it’s not quite the best fit, it’s complicated and it doesn’t solve the core goals of Inbox Zero. The core goal of Inbox Zero is getting your tasks out of your head so you can focus on what you need to do now. If you leave emails in your inbox and flag them, you still have to look though all of your emails to find the flagged ones. Or, if you have a filtered list of only flagged emails, you still need to read though your entire list of flagged emails to find what you need to complete now. That limitation causes you to waste valuable time and brain juice. Remember, your concentration and focus is a limited resource and you should try has hard as possible not to waste it. Inbox Zero is primarily a way to show you what you need to see but only when you need to see it. Stop rereading the same email titles over and over. When you have nothing you need to do at the moment, you should just see something simple like the picture above (Mailbox). It goes without saying that you need to find the tool that best fits your style. I definitely encourage you to try out a few of them out for yourself. Blow are some of the popular Inbox Zero tools and I’ve saved my personal favorite for last. GMail (free for all platforms) – Sure you’ve heard of it and it’s pretty likely that you use it too. But, have you really used GMail? GMail was the first major Inbox Zero tool on the scene. With their labels, archive and killer search it’s an extremely effective Inbox Zero tool. When you’re done with an email just archive it. If you want to throw it into a label based To Do List, you’re but a click away. Forget about trying to find an email, there is no better email search tool out there. All of my email accounts are on GMail, however I don’t use their interface or apps to manage my Inbox. Why? I like to schedule tasks to a specific time and I haven’t seen a great way to achieve that with GMail. Also, I have many email addresses and GMail segments my inboxes. Why can’t they mash it all together like they do in iOS? Bah! Sparrow ($2.99 for iPhone, $9.99 for Mac) – I love this app and I used it for quite a long time as my all around email solution. It’s a fantastic front end for GMail and the company was actually recently purchased by Google so I can only imagine the great things to come! I’m sure you all don’t get super excited about email but I happened to really like their demo video (and the song that it plays to). Have a look so you get an idea for the app. Overall, Sparrow is an excellent tool and I still use it on my Mac to manage my email and achieve Inbox Zero. Sparrow has an integrated inbox so you can get all of your inboxes to show in one view and you can easily archive email when you’re done to get it out of your way. Plus Sparrow’s search is killer because it can search across multiple inboxes at the same time. My only gripe is that you’re forced to look at all of your pending tasks and I want them out of my view until I’m ready to action them. That of course leads me to the greatest mail client out there…. Mailbox (free for iPhone) – Mailbox is everything I’ve ever dreamed of in an email client. It sits on top of GMail and supports labels/flags but more importantly it takes a completely new and fresh approach to email. The app gives you three core views of your email: emails to be processed, emails pending work and completed emails. The views fit perfectly with the Inbox Zero philosophy and the interface is incredibly intuitive. I’ve been struggling with keeping my inboxes under control for some time and Mailbox has finally forced my unruly inboxes into submission. Watch the video below so you can get an idea of how you can easily manage your inbox and simplify your life. Mailbox has done wonders for me and I highly recommend you at least check it out yourself. Best of all, it’s completely free! Hopefully I’ve got you pumped about upgrading your email client so you spend less time looking at email and more time doing things that matter. There are many more email clients that try to satisfy your Inbox Zero needs and I definitely encourage you to try them all – the above apps were just the ones that I thought did the job best. Remember, you’re not toying with email clients because you like nerding it out and you have nothing better to do (although personally I do like nerding it out). You’re spending some time trying to find the best tool for the job so that when you get organized already you’ll have so much more time to do the things you want to do. Know of a better Inbox Zero tool? Have an Inbox Zero success story? Hate Inbox Zero? Please share with us in the comments!